Manchester City hammered a hapless Chelsea to head back to the top of the Premier League at the expense of Liverpool. Sergio Aguero has given Manchester City an injury scare ahead of the busy festive period. The Argentina international was held out of Saturday's 3-1 win over Bournemouth with a muscle injury, and he is doubtful to face Watford and Chelsea this week after Pep Guardiola revealed club doctors warned him Aguero could be ruled out until January if he aggravated the problem. "The doctors told me (on Friday) Sergio cannot play," Guardiola said. "If he plays, maybe it's four or five weeks off. In that situation, this month, with a lot of games, he was not safe." "Right now, I'm not quite sure," Guardiola said when asked about Aguero's availability. "We'll see. That's why I said before day by day we see. I speak with the doctors every day, they make a report and a briefing. They say 'ready' or 'not ready' and we decide." Gabriel Jesus started against Bournemouth in Aguero's absence, but was unable to get on the scoresheet. Gareth Bale, Sergio Aguero and Alisson Becker are among the first nominees announced for this year's Ballon d'Or award. The honour, now separate from FIFA's own Best player of the year award, is bestowed annually by France Football magazine with the 30 nominees announced in groups of five, in alphabetical order. Wales star Bale - whose bicycle kick against Liverpool helped clinch the Champions League for Real Madrid - joined Manchester City striker Aguero and Liverpool keeper Alisson in the first batch. Bale's club-mate Karim Benzema and Paris St Germain striker Edinson Cavani were the other names in the initial quintet. Sergio Aguero has signed a one-year contract extension with Manchester City, the Premier League champions have announced. The Argentina striker, who became City's record goalscorer last season, is now committed to the club until 2021. Aguero, 30, has won three Premier League titles and scored 204 goals since joining City from Atletico Madrid in 2011. Aguero said: "I am happy for this additional year. My idea was being here for 10 years. I've been here for seven years, it's going to be 10 when the contract expires. "This was the main reason I signed. I'm very happy because they have treated me very well since the first day I got here. I'm very happy with everything that involves the club, my team-mates, the staff and the management team. "We have a good team, we need to be focused and if we are at 100 per cent, we have lots of chances to do great things." Aguero has previously spoken about ending his career back in Argentina with boyhood club Independiente after his City contract expires, but that will now have to wait at least another year. City director of football Txiki Begiristain said: "We are delighted that Sergio is extending his stay at Manchester City. "We are fortunate to have had one of the best strikers in the world at our club for so many years and I'm sure our supporters will be thrilled with this news." A Sergio Aguero double inspired Man City to Community Shield victory over Sarri's new-look Chelsea. Pep Guardiola does not expect club-record scorer Sergio Aguero to leave Manchester City this summer. There have been reports Aguero's former club Atletico Madrid are preparing an offer to lure the 29-year-old Argentina striker back to the Spanish capital. Aguero's future has been the subject of recurring speculation throughout Guardiola's two years in charge at the Etihad Stadium but each time the City boss has played it down. "I think it's not going to happen," said Guardiola. "My desire is it will not happen, but I don't know. "It's happened many times in these press conferences and I said maybe a thousand times Sergio is going to stay until he decides 'my time here is over'. "I said it last season and this season many times, and I say it today. That's why I say it isn't going to happen, but in football you never know." Manchester City manager Pep Guardiola has announced that Sergio Aguero's club season is over. The Argentinian has undergone a minor knee operation and Guardiola, whose side secured the Premier League title last Sunday, said he would be sidelined for four to five weeks at his press conference on Friday. Aguero is City's top scorer with 30 goals in all competitions. The injury does not appear to him rule him out of Argentina's World Cup campaign. Manchester City striker Sergio Aguero is recovering from an arthroscopy on his knee. 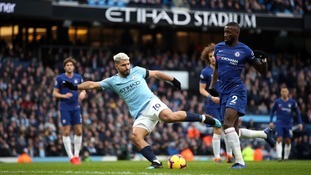 Aguero missed Saturday night's win at Tottenham after suffering an injury setback, but manager Pep Guardiola said last week he remained hopeful the 29-year-old would be available for the "last games" of the season. No timescale for his recovery has been given but, with City already crowned Premier League champions, the World Cup will be his main target. Aguero has not started a game since City's victory over Chelsea on March 4, although he was an unused substitute against Basel on March 7. Following his lay-off he returned to action as a late substitute in the derby defeat to Manchester United on April 7, when he was hurt in a controversial challenge from Ashley Young that went unpunished. After that he was unable to train fully in the build-up to the second leg of City's Champions League quarter-final against Liverpool on April 10. Again, he was only able to appear as a second-half substitute. "He made a huge effort, because after the action from Ashley Young against United, with problems in the knee, he could not train. Afterwards he could not run. "I don't know if he will be ready for Swansea (on April 22). Hopefully (he will be back) for the last games, if we need him, and especially for the World Cup." Sergio Aguero scored four as Man City put a sorry Leicester side to the sword at the Etihad.